More than half of Michigan consists of forest and other vegetation. The state has 18 million acres of forest, with more than 100 species of trees. Identifying the different species may seem overwhelming, but it gets easier once you know how to use the characteristics of a tree in the identification process. You can identify trees by their leaves, buds, fruits, flowers and even their shape and location. Begin a journal to jot down identifying characteristics of a tree as you work to identify trees in Michigan. Keep a Michigan trees identification book handy to help you look up these characteristics. Note the area around a tree you want to identify. 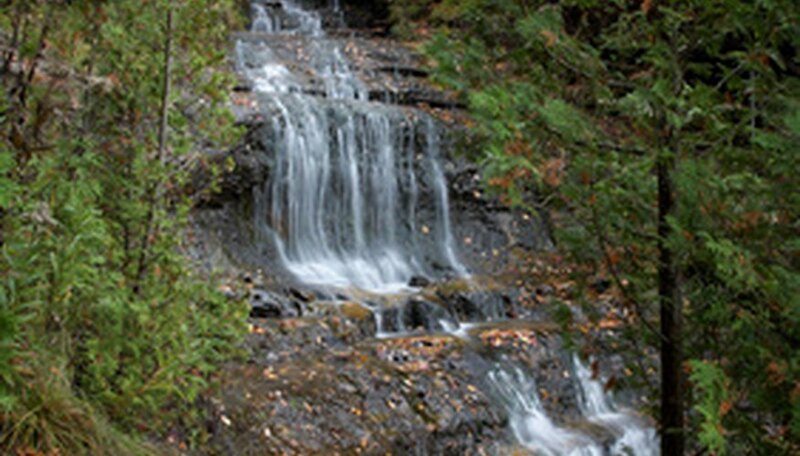 You are likely to find Tamarack, black spruce or cedar in wetter areas of Michigan. In cool, moist areas such as north-facing hills or ravines you may find hemlock or yellow birch. Determine the general shape of the tree you want to identify. Trees such as the vase-shaped American elm have distinctive shapes that make identification easier. Check the bark and note whether it's smooth or rough. Also, note the color, thickness and patterns on the bark. You can easily identify birch, aspen and elm by their bark. Look at a branch of your tree. Note whether branches with leaves come off the main branch opposite one another or in alternate patterns. Note the shape of the leaves. They may be oval, oblong, ovate, obovate, lance, deltoid, elliptical, or heart-shaped. They also may be needles or conifers. Pay special attention to the shape of the margins along the edge of the leaves. They may be wavy, finely serrated, coarsely serrated, teethed, lobed or smooth. Also, note the leaf texture, size and color. Look at the twigs on your tree to see if they are smooth or hairy, slender or chubby or if they have special marks or colors. Look for buds along the twigs. Note the color, size and shape of bud scars. An oak tree may have a cluster of buds together while a sugar maple has pointy buds. Identify the color and shape of the flowers on your tree, and note the time of year they bloom. Note the type of fruit your tree has. A tree may have helicopters with seeds, cones, nuts, legumes and any type of fruit that holds the seed for the tree. Use the information you've gathered about your tree to identify it. Your identification book will have sections where you can look up leaf, flower, fruit and other traits.